In last week’s blog post we looked at what resources we have available for Patient Advocates. This week we would like to go a step further and introduce our latest resource for advocates – Patient Assistance Resource Education (PARE). 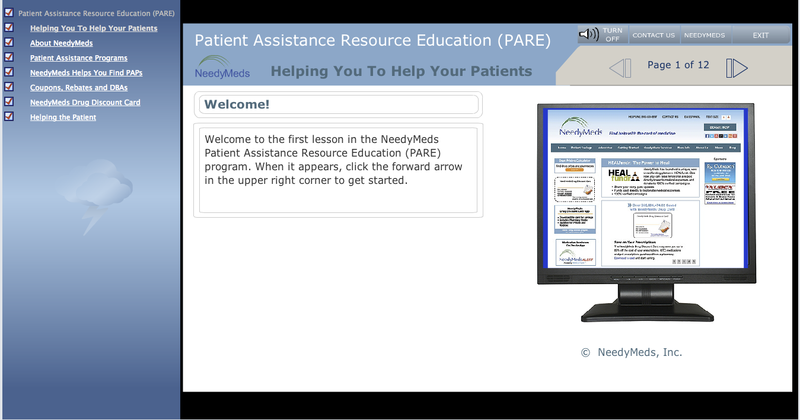 The purpose of PARE is to educate healthcare professionals on how to best utilize NeedyMeds to serve their patients. Advocates and medical office staff complete a web-based and self-paced course that goes in-depth into all of our databases and resources. After completing PARE, advocates will be able to navigate the often confusing and complex world of patient assistance. 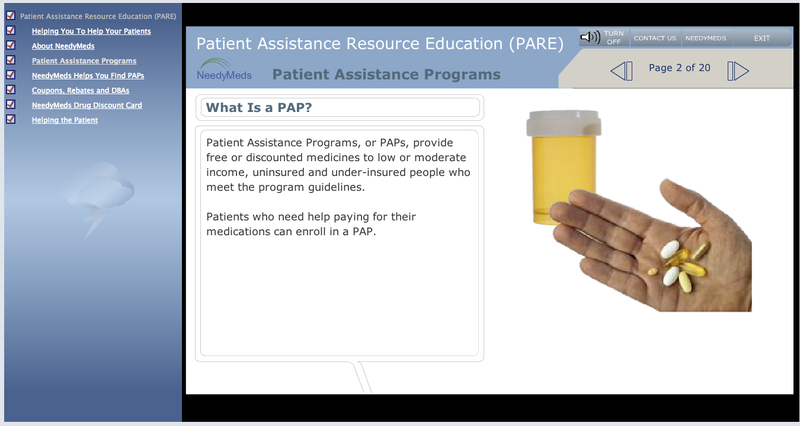 One of the primary lessons is on Patient Assistance Programs (PAPs). We currently list PAPs for over 4,381 drugs on NeedyMeds.org. However, many people are unaware of how to apply to a program, and how the programs actually work. Every PAP is different, with different eligibility requirements. Using PARE, advocates and medical professionals will learn how to use NeedyMeds to find and enroll their patients in these programs. PARE provides guidance to professionals on how to assist individuals in a medical office setting, especially when they can only spend a limited amount of time with each patient. In addition to a comprehensive demonstration on Patient Assistance Programs, PARE also covers other aspects of the NeedyMeds site. This includes lessons on programs for Chronic Diseases, our database of Coupons and Co-Pay Assistance, and our Drug Discount Card. After completing the course, students take an exam. Upon passing the exam, students receive a certificate of completion from NeedyMeds. If you are interested in PARE for yourself or a member of your staff, send an e-mail to pare@needymeds.org for more information. You can find more information and purchase the tutorial here. Please send me more information on pare program. Please forward information PAP and Pare and requirements to participate. Please send information on pare program.